Bhubaneswar: Deceptive and false advertisements are not just unethical, it distort competition and also consumer choice. False and misleading advertisements violate several basic rights of consumer including right to choose and right to be protected against unsafe goods and unfair trade practice, said speakers here on Friday. 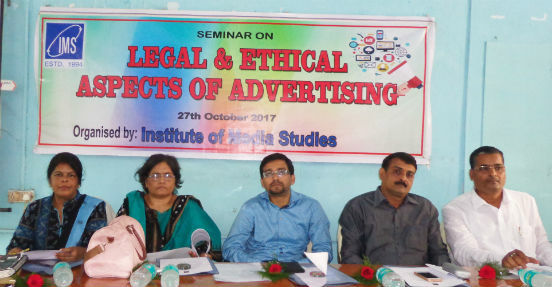 Speaking at a seminar on ‘Legal and Ethical Aspects of Advertising’ organised by Institute of Media Studies (IMS), Member of State Women Commission Snehanjali Mohanty said women and children are easy prey to advertisements. There are more women portrayed as being alluring to men and they are being viewed as sexual objects advertisements, she said. Communication Expert and Chief Manager (Corporate Affairs) of Paradeep Phosphates Ltd (PPL) Sudhi Ranjan Mishra called upon students to be creative and innovative while making advertisements and purse career in the sector. Advisor of State Institute of Consumer Awareness (SICA) Sasmita Pattnaik said despite several laws meant to protect consumers against unfair trade practices, false and misleading advertisements continue to exploit the consumer. She highlighted on Consumer Protection Act, 1986. Among others, Managing Director of Fast Communication Trinayan Rath and Director of IMS Prof Upendra Padhi also spoke.